Thanks for the comments everybody! I thought, I answer some of these here. 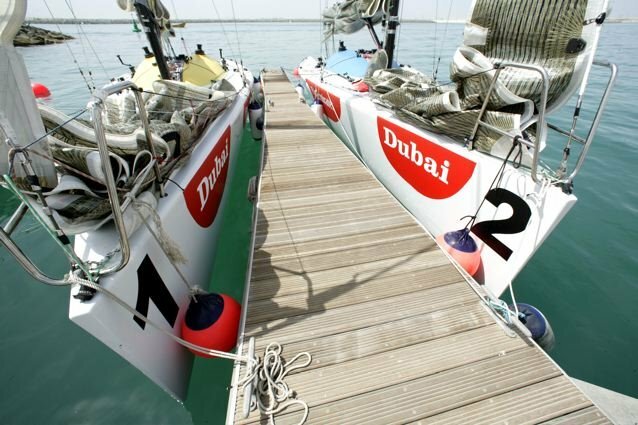 Firstly the boats in Dubai. The exact observation was that one boat was significantly slow in accelerating, especially after tacks. I'm not so sure about its boat-to-boat performance. Different boat-builder guys there had different ideas about the source of this: weight, propeller not closing properly, and sail cut. This last one was apparently mentioned by Russell Coutts who was there earlier this year. I'm not sure though. There was nothing obvious with the sails. Neither with the standing rigging. The mast and shrouds seemed equally tuned. No problems, with steering. So, my guess is that it was weight related. As for the plans for the future. This year started very fast, with a lot going on and it was not optimum. I actually wanted to have a well-planned year so that I can slowly build up a team with Grade 4 and Grade 3 races. But the oppurtunities at Nations Cup and Rimini made me take early steps...So, now I want to slow down a little and go back to the original plan. I'll try to make 3 more matches before the end of the year, mostly Grade 4s. The aim is to do all this with the same team, which would also be my long-term team. Finally, the photo is from the Nations Cup showing us in action! I was in Rimini, Italy last week participating at the Selection for Blurimini, a grade 2 event hosting many America's Cup teams. Combined with my defeat at Nations Cup these last two weeks were the low of my short match racing career. I finished simply last, losing all my matches at the round robin stage! The bad performance resulted from the combination of many things including my bad mood after the Nations Cup, sailing with a team that came together for the first time, having a significant language barrier on board, and the strength of the competition. Being the selection for the prestigious Blurimini race, the line up for this event included 4 teams from top 100, with best ranked team standing at number 12! Against this tough competition I had friends from Italy and my wife as crew. We were sailing together for the first time and neither my friends nor my wife sailed a match race before. Even though they were all good sailors the lack of match race experience showed, especially against such competition. Looking at the line up I knew before racing started that we could at best hope for a 6th place. There were 3 teams that we could beat. Unfortunately a combination of bad skippering from my side and an unfortunate pairing list saw us loose even against those teams we could beat. We started racing with 3 losses against highly ranked teams, even though we rounded the first mark first in 2 of these matches. With such low morale we faced a team in the last race of the day that we thought we could beat. Unfortunately, we lost the match altough we led until the mids of the first downwind leg. In the light air conditions, our gybes were simply not smooth enough to keep us in front. After a good dinner that night we found our morale again and went to water next day, knowing we could only win two of the 4 matches that waited us. The first match was against 12th ranked Simoncelli. Although we lost it was fun sailing against them. For the second race the wind picked up and we lined up against the Slovenian Team for the Nations Cup. Trying to give them a good fight at the start (we almost won it) we catched the anchor line of the starting line. Besides causing us loose that match this incident lowered our morale again, just before the last two matches that we could win. The first of these we executed a perfect pre-start combination giving the other boat a penalty and starting in full control. But the wind had picked up a lot by this time and we were having serious trouble keeping the boat under control. At the second downwind with the finish almost in our grabs, we broached and by the time we got the boat going again they were right on our neck. Taking us in their wind shadow they managed to beat us to the finish line. The broach had teared our spinnaker and jib and a miscommunication between us and the racing committee resulted in them starting the next starting sequence before we fixed these problems. As a result we were not able to start for the last race, finishing the event with 0 points. Although I took a bad beating this weekend, I try to look at the bright side. I had a chance to sail against very good teams and I had a chance to learn. And learn a lot I did. The most significant difference between the best team and the others was that they sailed the boat just like a dinghy, executing every manevour to perfection, that they put the priority in pre-start to winning the start rather then giving the other boat a penalty, and that they always kept the boat moving in light air conditions. These observations made me realize one more time that the primary aim for me should be to form a team that I can sail with continously for a couple of years so that we can reach this level of sailing. Only then, would it be possible to reach top 50s in the rankings.